Have you ever noticed how quickly kids memorize things when they are set to music? 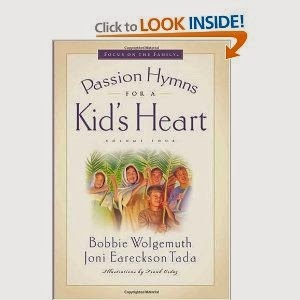 A great way to capitalize on that is by soaking them in the great Hymns of our faith. Good hymns have depth and history and theology and a powerful upward focus on God. I want my kids' heads to be filled with lyrics that will help them through the days of life. And they memorize them so easily! 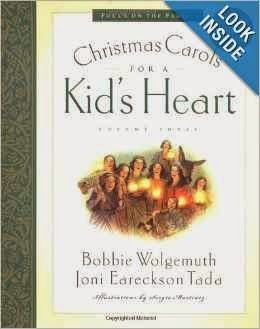 All we have to do is remember to play them (on our radios, record players, cassettes, 8-tracks, ipods, ipads, computers or cd's)...and our kids will almost effortlessly soak in the tunes and memorize the words. 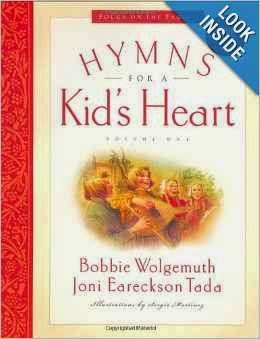 Hymns for a Kid's Heart is one great resource for kids. The books are beautifully illustrated and tell the stories behind the hymns. The CD recordings are quality, traditional and kid-friendly. Search iTunes to purchase and download single hymn recordings for around a dollar and make a "Hymns" playlist in your itunes so you can easily click them on during breakfast or whatever you choose as your listening time. 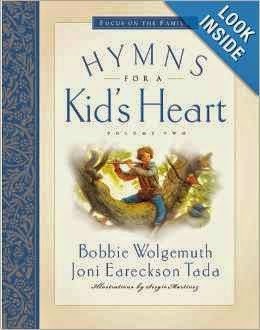 Purchase personal-sized hymnals for your kids to use during family devotions. Our kids think it's cool to have their own, and the novelty factor is a good way to get them involved with the words in front of them. I need no other argument; I need no other plea. And my spirit is lifted, just typing those few little hymn excerpts. The truth is: I need to listen as much as my kids! The combination of uplifting music and Truth-filled lyrics is just what I need to bring perspective to many of my days. There are so many, many powerful hymns and ways to listen. Please share your favorites in the comments below!